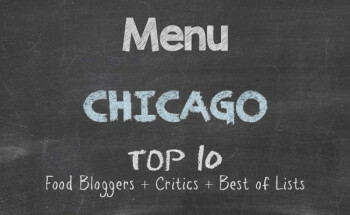 Greater Chicago boasts a large number of Thai restaurants. 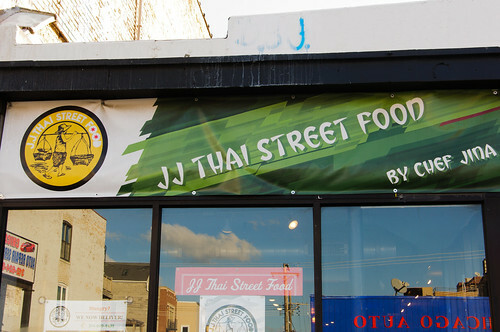 There are two that have been my absolute favorite: JJ Thai Street Food at 1715 W. Chicago Avenue in West Town for authentic Thai street food and Herb at 5424 N. Broadway Street in Edgewater for refined Thai with 100% authenticity. 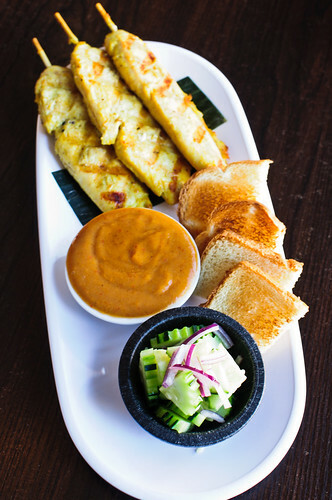 After most recent visits to NaKorn Urban Thai at 1622 Orrington Avenue in downtown Evanston, it has officially become my third go-to Thai restaurant. 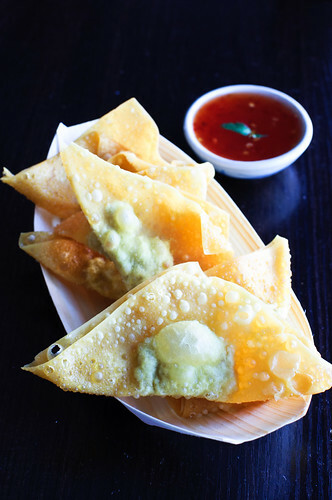 While passing through Evanston and a quick search to see what offerings were on the menu at NaKorn, there was a draw to the complete absence of a lot of ubiquitous Thai dishes (e.g., pad thai, pad see ew, curries, Bangkok chicken, bamee noodles, and the like). 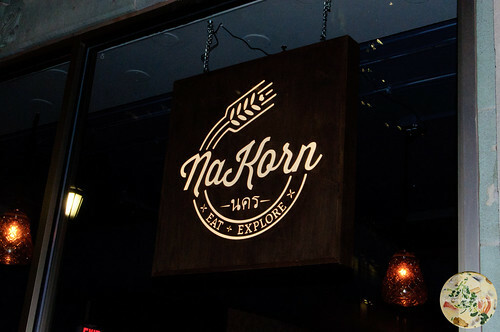 Recognizing that my original list of two favorite restaurants didn’t serve those staples and I had fallen in love with their dishes, I imagined that NaKorn was a winner. Not a large restaurant, but not small either, it’s airy and spacious for those who like to enjoy their meals with dinner guests or alone without having neighboring diners practically sitting on top of you. 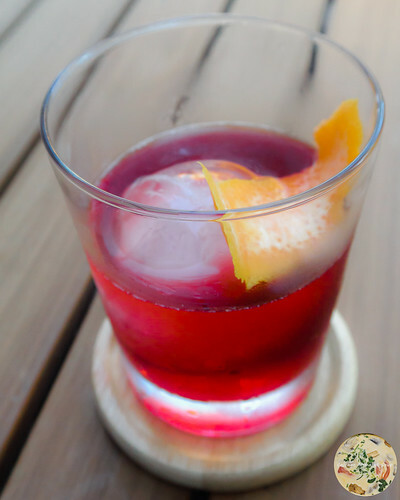 For my first visit, I sat outside to enjoy the summer weather and to imbibe a negroni while figuring out what I wanted for dinner. And oh was the negroni a hit without being heavy-handed: just perfect. I opted for a prix fixe flight of three courses. The first was taro chicken. 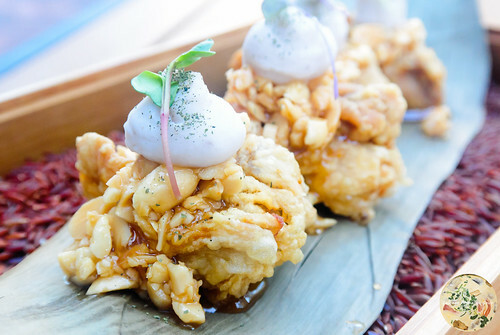 Marinated in lemongrass-infused coconut milk and fried lightly before coated in a chili-peanut gastrique, this appetizer popped with flavor. 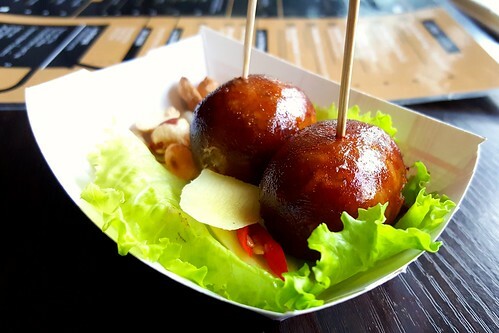 As much as I joke about hating peanuts, the flavor was faint yet not to a point of being undetectable, but enough to let the coconut and taro take center stage on the palate. Simply outstanding. The second flight was pan roasted whitefish fillet with a sweet pepper chutney and chili tamarind reduction. The whitefish was not only flaky but it was also tender, clearly prepared to perfection. 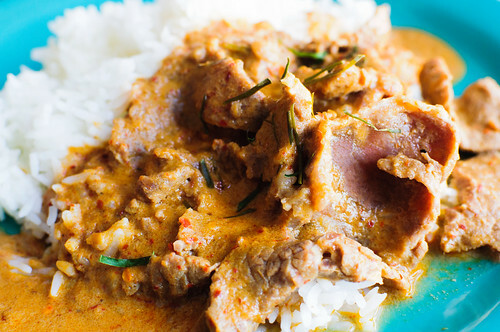 Rather than having this with an air of pomp and circumstances, this dish is best eaten mixed together. 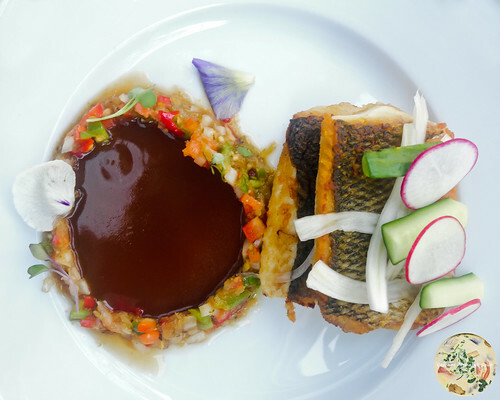 Having the fennel, cucumber, radish, whitefish, chutney, and tamarind reduction is a symphony. For my second cocktail, I was in a bit of a New Orleans mood, so I ordered a sazerac. 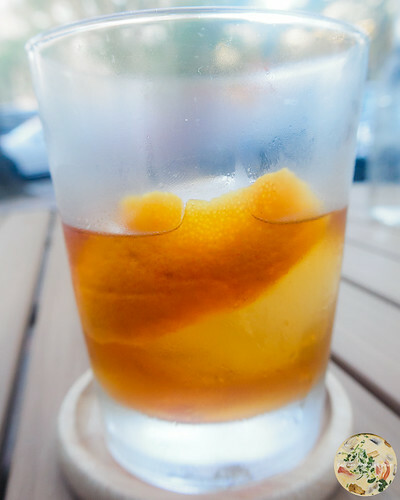 My restaurant adviser and I laugh about how at one of Chicago’s most touted restaurants, I left a sazerac at the bar intentionally because it was heavy on the alcohol and tasteless simultaneously. That was not the case with the sazerac at NaKorn. This one was smooth, in the same manner that they mix them in New Orleans. 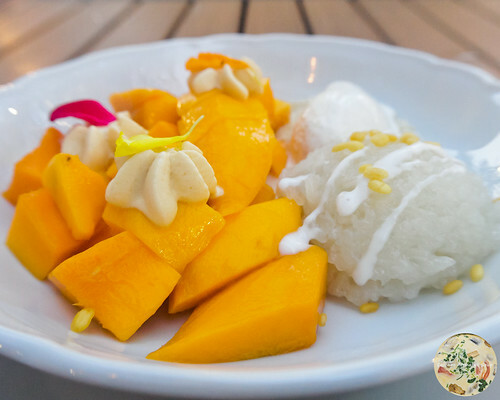 The finale was a plate of mango and sticky rice. While you can never go wrong with mango and stick rice, this dish fueled an addiction that made me catch myself when I was tempted to order another plate of it. The sticky rice had been prepared to order, evident in it not being gummy. And to make the dessert that more appetizing, there was a scoop of vanilla bean ice cream served with it. Yes, that did add a twist while kicking an old favorite up several notches without compromising any of the love in all of the bites. Giving myself time before a return visit, I included my restaurant adviser for the second jaunt. We opted for a few dishes without going overboard because she had made a suggestion for another visit so we could sample from the upcoming autumn menu. Really paying attention to the menu and also having brief conversation with one of the managers, it became apparent that the dishes were of the variety enjoyed at home in Thailand proper. That explained why there wasn’t even basil chicken available for ordering. 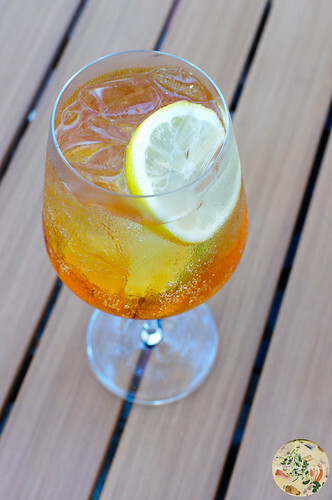 To keep the summer theme going, my adviser ordered a North Shore Punch. I ordered a Shake and Shimmy. 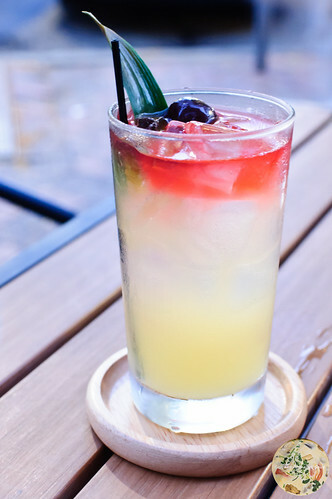 The North Shore Punch looked artsy, a visual parfait of vodka, lemonade, and Thai chili-honey syrup. The Shake and Shimmy was a refreshing cocktail of rose hip, Brut Rosé, cranberry, and soda. 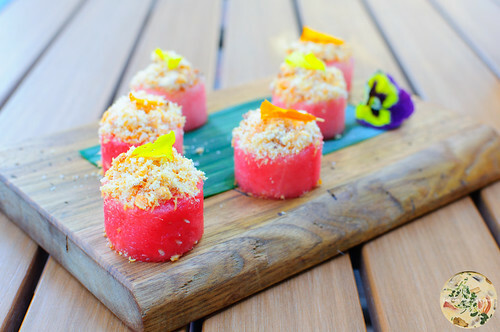 And in our Garden of Eden, we had watermelon bites topped with crispy shallots. I never would have thought the combination of watermelon and shallots would be so divine. 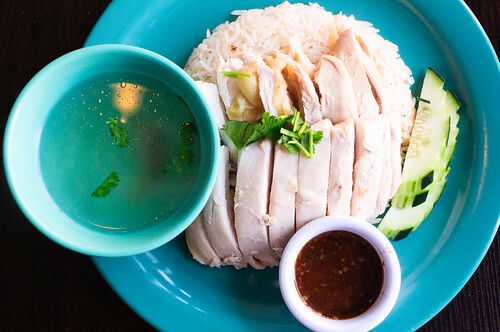 When the manager described this as a summer dish that her grandmother prepared when she was in Bangkok, I understood why this was a favorite of hers. The next shared dish was vegetarian scallops. Eryngii king mushroom had been prepared so that it had the consistency of tender scallops and had I not glance at the menu a second time, I never would have known the difference. 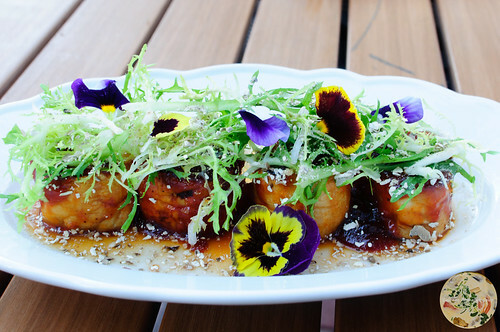 Served with a house made chili jam and topped with frisée and edible flowers, this was another flight that my adviser and I agreed should be eaten slowly so to experience the kick from the chili jam appearing and disappearing on the tongue. Plus, the whole concept of mushroom passing for scallops, albeit not as a trick, is simply fantastic and creative. 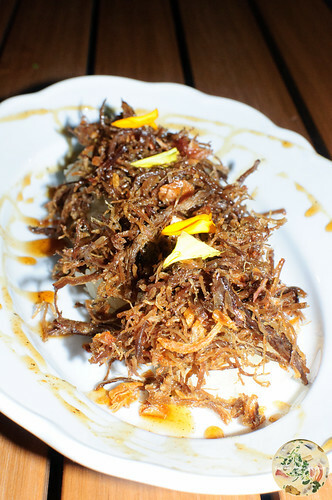 The third landing was a plate of coriander crispy shredded beef brisket. Described as having been shredded by hand, it was apparent there was a lot of preparation involved in the the dish, but what made it a case study in “Best Beef Brisket Ever” was the right amount of herbs and spices used without overpowering the taste buds. Served atop sticky rice, I will now be very critical of any brisket I have in the future because the culinary bar in preparing succulent brisket has been raised thanks to NaKorn. Moving into the main flights, the first entrée was a plate of steamed baby lobster tail with kohlrabi, micro greens, and a Thai chili broth served with coconut rice. With both adviser and me being seafood fanatics, every morsel from the lobster dragged through the chili broth made for a culinary delight. 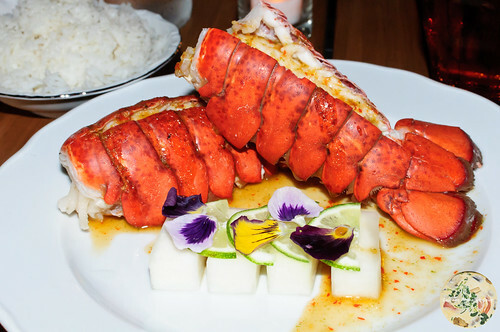 This was the first time I have had lobster at a Thai restaurant and this recipe has become quite possibly the one I will hanker for when lobster is on the menu. Plating was visually stunning. However, there was a point when we resorted to using fingers for extracting the plump meat from the shell and dispensing of using forks except for when eating the rice. 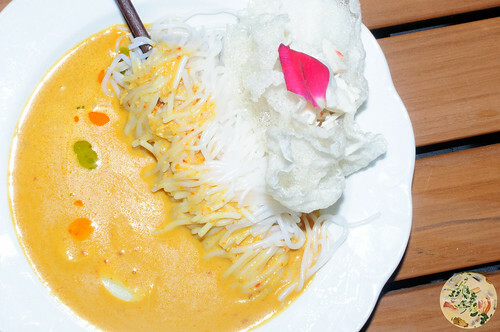 The second entrée was a plate of jumbo lump blue crab served with Thai rice noodles and a spicy turmeric-coconut curry soup poured on the side. Three words come to mind again: Garden of Eden. The crab was fresh and I can always count on my adviser to speak to the quality of crab, of which she vouched could be the equivalent of truth serum. Certainly the aroma was inviting just from the wafting while arriving at the table. 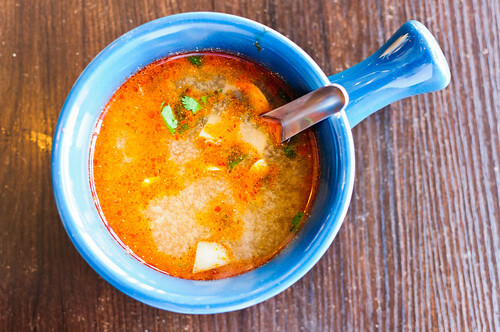 The soup had a flavor akin to what one finds in kow soy. 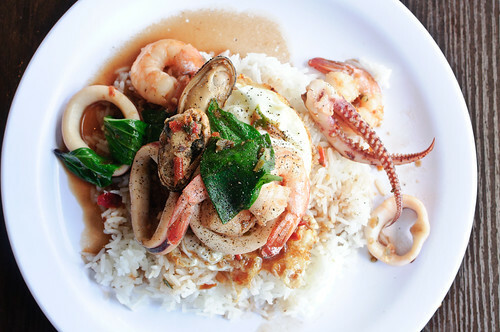 The lump crab made it one of NaKorn’s most recommended dishes. 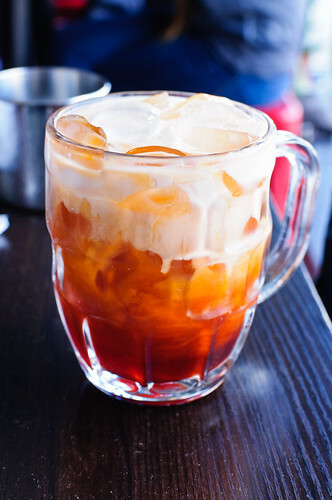 The finale was a take on a favorite that we have had at one of the Thai restaurants I mentioned earlier. There was a mix of jackfruit, mango, and water chestnuts. 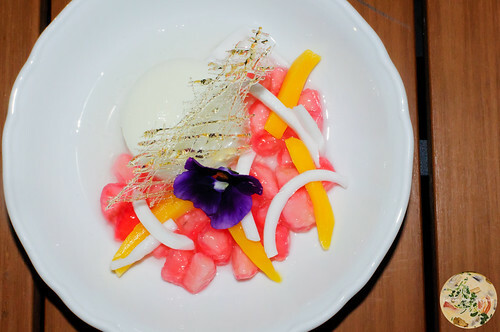 This is usually served in coconut milk with a little bit of sugar, but instead it was served with a scoop of panna cotta. Thailand meets Italy. Aroi. Delizioso. Outstanding. For an absolute scrumptious dinner, this wrap-up left us with a want for a quicker return than we scheduled.